This recipe is kind of like making individual peach cobblers, except no chopping (except to cut them in half) or peeling the peaches. It is not super-sweet, just enough to feel like a dessert. The peaches keep their natural flavor and sweetness. Add melted butter, vanilla, and honey. Whisk eggs and pour into bowl. Slice peaches in half. Remove pits. Scrape out the area that surrounded the pit. Place peaches in a glass baking dish. For easy cleanup line the baking dish with foil or parchment paper – I like the parchment paper/foil combo I recently found. 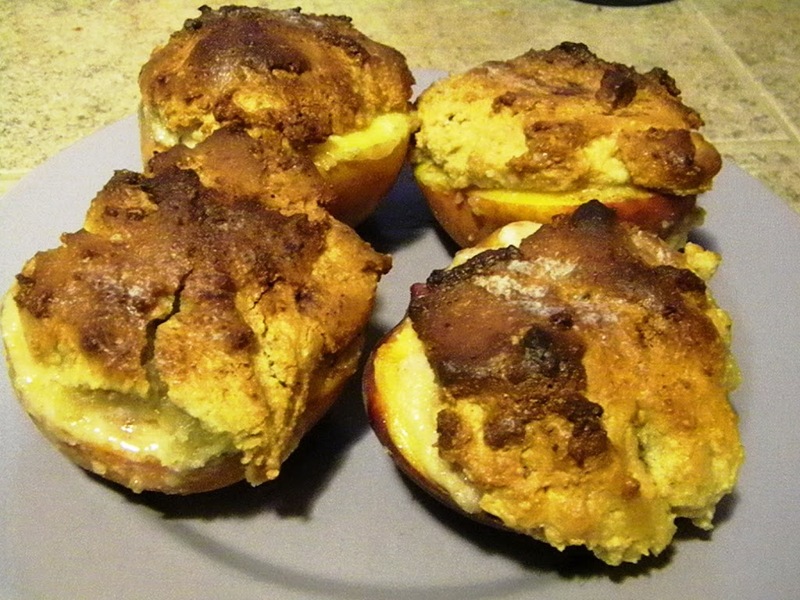 Drizzle a little honey over the peaches and sprinkle with cinnamon. Scoop batter on top of the peaches so it fills the hollow of the peach and covers the top in a thick layer. Sprinkle a little more cinnamon over the batter. Bake for 30 minutes, until shortcake is golden brown on top. Add a little (like a 1/4 – 1/2 tsp) butter to the tops of the shortcakes. Cover dish with aluminum foil and bake for an additional 10 minutes. Allow to cool a little before serving, but it is good warm. This recipe being shared on SCD Sundays and Slightly Indulgent Tuesday.